The screaming sounded like it would last forever. It was a high-pitched, hissing scream. I stood to one side and watched, trusting that all was happening as it should with my new pressure cooker. A friend with a sailing background suggested that we might use a pressure cooker on our boat to avoid spillage. Following his advice, I bought one, but I have been putting off using it for fear of an explosion. 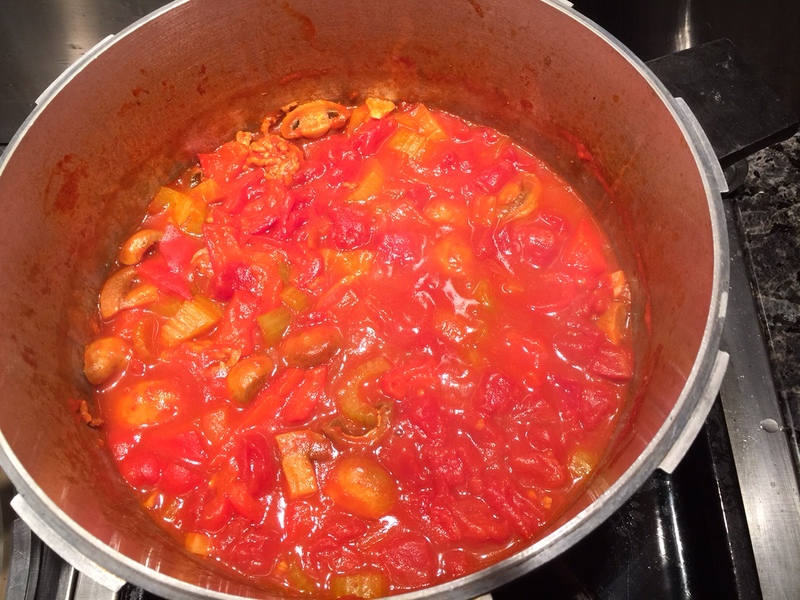 My husband used the pressure cooker when I was away in Antigua in April. Bolstered by his positive experience, and our impending liveaboard move, I thought I would give the pressure cooker a try this evening. 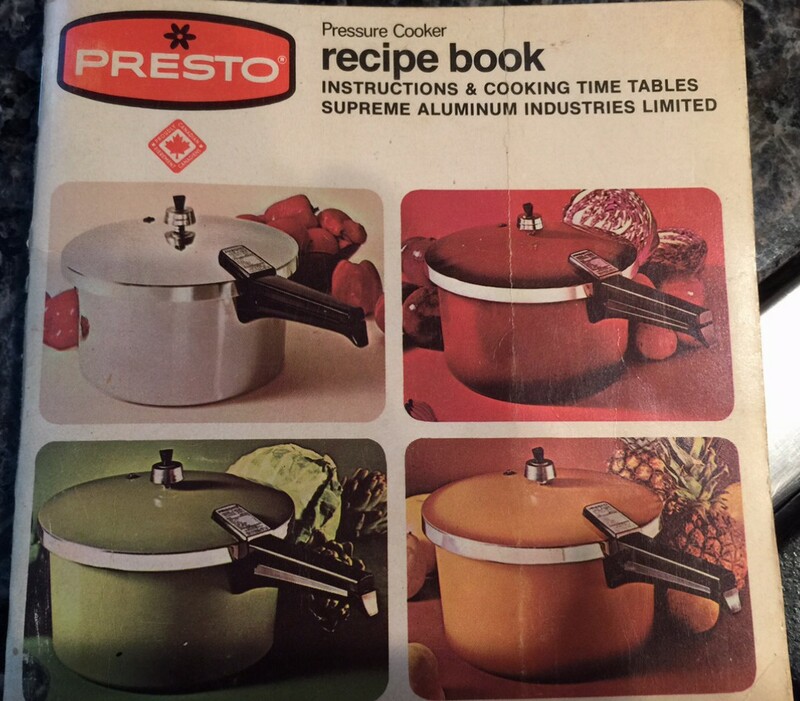 Purchased at a thrift store – my pressure cooker includes the original, vintage user manual. The manual provides a host of interesting recipes that speak to a different time, including: Economy Pork Steak, Chinese Pineapple Lamb and Fresh Tongue. My vintage Presto User Manual claims to describe “the modern way to cook for family health and pleasure”. For my first attempt, I didn’t follow a recipe from the manual but I did look to it for guidance. Tonight, I made chilli, which I usually make using the slow cooker. 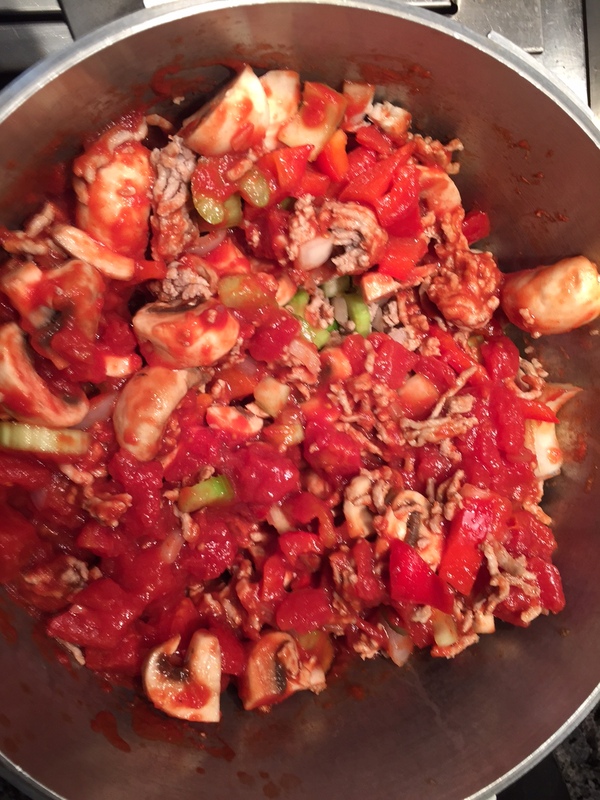 Pork chilli is a staple for my family. Here is what my chili looked like before I put the lid on the pressure cooker. BEFORE: ingredients assembled for chilli. And, here is what the chilli looked like after it had cooked for only 12 minutes. AFTER: ingredients after being cooked for 12 minutes in the pressure cooker. When you use a pressure cooker, the lid is on. You have to wait for the steam to build, which eventually rocks a pressure regulator back and forth, and then you begin to time the cooking. To me, the time spent waiting for the regulator to rock seemed interminable. I was either following the instructions properly, or about to injure myself very badly. Fortunately, things went well. When the cooking was over, I released the steam valve and an assertive stream of white vapour came with it. A waft of chili forced its way through the pressure nozzle. I added a tin of canned kidney beans, and my kids seemed to really enjoy their dinner. My pressure cooker cost me $9.99 at a thrift store. On Amazon, a similar 6 qt. pressure cooker sells for $80 US. But, it lacks the personality of my unit. My pressure cooker included the original manual and some valves. I’d like to think that the previous owner had carefully organized these items for sale. Perhaps they did. But, based on the dusty appearance of the pot when I bought it, I suspect they were just organized to begin with. The pot is quite large, and was likely used by someone cooking for a family. Perhaps it was someone who, like me, stayed at home with their kids. I’m so pleased that this pot was a success, and will definitely be using it on our boat. And, like our boat, which was used and well-loved before we took ownership, I enjoy that our pressure cooker brings a bit of history.